Privacy concerns keep this good VPN from being truly great. SaferVPN has been around since 2013 and is located in Israel—a country with stringent privacy laws that shield companies and citizens from its many forms of government surveillance. This, combined with the company’s no-logging policy, should keep any of your online doings safely under wraps while you’re using their services. However, Israel has been known to share information with Five Eyes (FVEY), an intelligence sharing agreement between the U.S.A, U.K., Canada, New Zealand, and Australia. That the company maintains an office in New York City compounds concerns over this point. If you live in a Five, Nine, or Fourteen Eyes country and have concerns that regional laws may not be enough to keep your online activities from being shared with your government, SaferVPN’s services may not be for you. That “no logging” policy that we mentioned earlier? It’s not strict. If you use SaferVPN, they’ll retain data on the date and time you accessed their servers, which country you were in when you connected, the country location of the server you chose to tunnel to, and how much data was transmitted during your session. That said, the company doesn’t record IP address information and has no knowledge of what you’re uploading or downloading. SaferVPN’s Mac app comes equipped with a kill switch that, when activated, will stop all upload/download activity on your computer in the event that you’re disconnected from the company’s VPN network. Like other VPN providers, the service uses AES-256-bit encryption to keep your data traffic locked away from prying eyes. On Macs, the SaferVPN app defaults to using OpenVPN to connect to the company’s servers. If you prefer, switching to L2TP over IP Sec, which offers slower connection speeds, is as easy as clicking a button in the app’s settings. I found their Mac app to be easy enough to use, as it offered easy access to the company’s server list and a settings menu that features clear descriptions of what each option on it does. SaferVPN isn’t forthcoming about the exact number of servers in their global network. Its website states that the company’s customers can connect to “700+ premium servers in over 35+ countries.” This isn’t as many servers and locations as other providers offer, but it’s still a respectable number. Given that this is a paid service, we’d appreciate knowing how many servers users actually have access to. It is possible to engage in P2P file sharing using SaferVPN, but only via one of their servers. This could make for painfully slow file transfers. 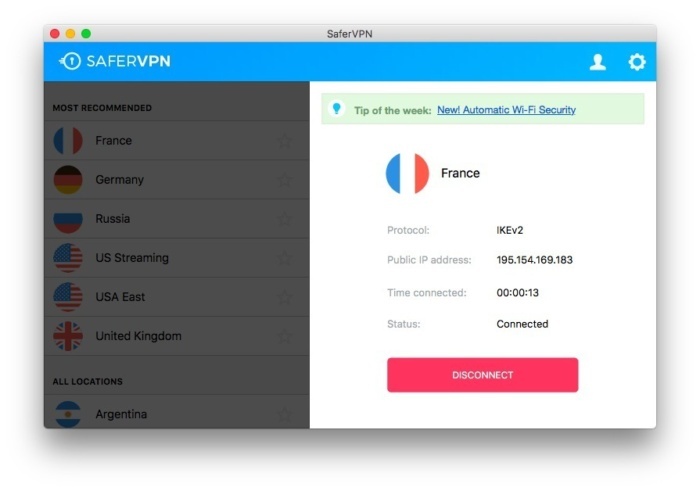 Any of SaferVPN’s three subscriptions provide users with VPN access for up to five devices simultaneously, with free client apps for Mac, iOS, Android and Windows. During testing, connecting to SaferVPN’s servers resulted in the following upload/download speed reductions versus connecting to the Internet without a VPN. Learn more about how we tested VPN software. If you’re interested in using SaferVPN on a month-to-month basis, it’ll cost $10 every 30 days. The best value is a two-year subscription for $84, which breaks down to around $3.50 per month. SaferVPN also offers a one-year plan for $60, which works out to $5 per month. No matter which plan you invest in, the company offers a no-catch 30 day money back guarantee. Payment can be made using a credit card, PaymentWall, PayPal, or Bitcoin. While the physical location of SaferVPN’s offices is a concern, given the potential for user data being shared with a number of governments, the online security and anonymity of the company’s service is capable enough to keep users’ online traffic safe from non-state sponsored hackers.